As we head northeast from Las Vegas toward the Valley of Fire, we listen to an iPod playlist of Gram Parsons’ Ooh Las Vegas, Joni Mitchell’s The Dry Cleaner from Des Moines and Elvis Presley’s Viva Las Vegas. We are definitely getting into the mood. I am with my family on a road trip that begins and ends in the vibrant, chaotic fluorescent-lit Las Vegas. It’s a city of acting out, of outrageousness, bright lights and big shows. No subtlety here. But it’s also a city, like New York or Chicago, which now also caters to families, with hotel swimming pools, kids’ meals, circus acts and ziplines. Ironically, Las Vegas became even more popular in the 1950s when the mushroom clouds being emitted by atomic testing attracted rather than repelled tourists from the city. Its metropolitan area now boasts more than two million residents, and another 39 million visitors each year. But we have chosen Las Vegas not as a destination in itself, but as the gateway to the natural wonders that lie close within reach—the nearby desert, canyons and mountains that spill out into the valleys and extend into southern Utah within a few hours’ drive. In Las Vegas, we spend a day exploring the 3.5-mile long Strip along Las Vegas Boulevard, with its mega casino resorts, Broadway shows, shopping and world-class restaurants. But we choose to stay near Fremont Street, which tends to be a bit less expensive and more low key during the day—although the area comes alive at night with rock cover bands, buskers and even a zipline over the street. 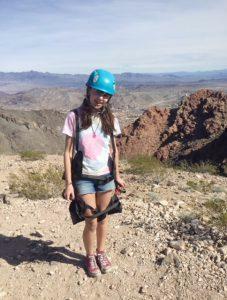 Our first day, we went ziplining near Boulder City with Flightlinez. It began with a short bus ride up a windy road, where we were entertained with a hilarious and spontaneous improv comedy routine from the Flightlinez team. Then in no time we were off the bus, and soaring at speeds up to 60 miles an hour down the Red Mountains on four adjacent lines. With awesome views of the Mojave Desert, even getting temporarily stranded mid-air (because I was too light to propel myself across) meant quiet contemplation until I was expertly rescued by one of the guides. We later visited the nearby Hoover Dam, a massive structure built during the Depression to control flooding along the Colorado River and supply hydroelectric power and water. To learn more, you can take an official tour of the dam or simply stop alongside the highway to take in the massive intake towers in Lake Mead, and drive over the Hoover Dam Bypass Bridge, which extends 890 feet above the river. But arrive early to avoid traffic. Returning to Las Vegas that evening, we head to Treasure Island to see Cirque du Soleil’s magical Mystère. We loved the performance—the extraordinary acrobatics, and the campy theatrics, like the man dressed as a baby, and an audience member locked in a box while a clown cuddles up to his wife. The next day we explored more of LV. We had an excellent taco dinner at the China Poblano, a restaurant in the Cosmopolitan Hotel that expertly fuses Mexican and Asian cuisine. And we took in the works of four talented contemporary artists at their Wallworks art project in the hotel’s underground parking garage. After LV, our next stop is Zion National Park in southern Utah, with the Valley of Fire en route. Unfortunately, torrential rains and mechanical car problems prevented us from reaching the 40,000 acres of red Aztec rock formations in the Valley. But we were consoled knowing that we had Zion National Park as our final destination. 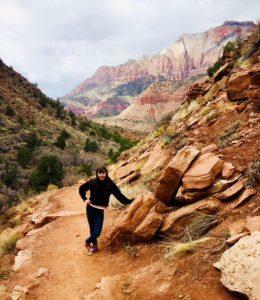 The next day, we explored several family-friendly hikes—the Lower and Upper Emerald Pool Trails with its magnificent waterfall, the Watchman Trail, the short half kilometre Weeping Rock Trail, and the Riverside Walk following the Virgin River. We travelled from one trailhead to the next via a free shuttle, one of many that run regularly from the visitor centre to nine locations along the Zion Canyon Scenic Drive. No cars are permitted along this route. And in between hikes, we had an excellent taco buffet at the Zion National Park Lodge’s Red Rock Grill. That evening, we explored the neighbouring town of Springdale, with its stores selling everything from gemstones and jewelry to sporting gear and Zion t-shirts. 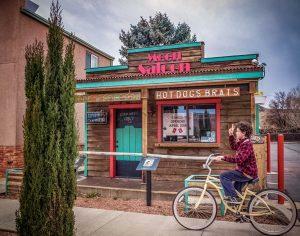 Originally a Mormon farming community, this pretty town just outside the park is now focused on tourism. With the red rocks looming above, anything along this short strip—from restaurants to inns, motels and restaurants—were lent an otherworldly beauty. We then drove through the east side of the park – a beautiful drive along switchbacks out of the canyon and through the mile-long Zion Mount Carmel Tunnel toward Kanab. The sign next to a statue of a cowboy on a rearing horse off Main Street reads “Little Hollywood,” a nod to the more than 100 movies and TV shows filmed here, including The Lone Ranger, Billy the Kid and Planet of the Apes. For a nostalgic wander through remnants of old Western movie sets, Kanab’s Little Hollywood Museum is open—and free—for viewing, with relics of an old Western town, with a saloon and even a jailhouse, film props and other cinematic memorabilia. This mythical American West landscape is also the home to an array of 1,600 orphaned dogs, cats, pigs and other animals who live, seemingly quite happily, on site of the Best Friends Animal Sanctuary, the largest no kill animal shelter in the United States. You can stop by here for an audiotaped tour of the sanctuary in your own car. Or you can join one of the bus tours, which includes stops in Dogtown and Catworld, with highly controlled interactions with a few dogs and cats. The town of Kanab is also what resident and Rocking V Café owner Victor Cooper refers to as “base camp” for all the hiking and mountain biking in neighbouring canyons and state parks. You can stay in Kanab and hike up the Squaw Trail that winds around the red mountains bordering the town; drive a short distance to Coral Pink Sand Dunes State Park, with its miles of rippling pink sand; or head to the Toadstools, which really are hoodoos in the shape of toadstools. Kanab is also a perfect base for a series of longer day trips: Zion is 45 minutes away; the famous hoodoos and arches of Bryce Canyon a mere 1.5 hours’ drive, and the north rim of the Grand Canyon is about the same. But be forewarned that Bryce and the Grand Canyon, though relatively close, are likely to be much colder—and potentially snow covered in spring. Rather than returning to downtown Las Vegas for our last night, we chose to stay in Lake Las Vegas, which is about the same distance from the airport—about a half hour’s drive—but an entirely different side of Nevada. Lake Las Vegas is the man-made lake at the centre of a massive project undertaken by a wealthy developer in the late ‘80s and early ‘90s—with high-end resorts, an Italian-style village with restaurants and shops, and golf courses and a residential area. But then—with the housing crisis, many projects went bankrupt. Today Lake Las Vegas is still struggling to repopulate itself—there’s an aura of glamour but also a sense of abandonment. But for us, it was quiet and welcome retreat from Las Vegas. We stayed at the Westin, where we found a mixture of young families and older guests: the resort has two outdoor pools, free one-hour kayak rentals on the lake; ping pong tables and corn toss set up on the lawn. The kids were enthralled. 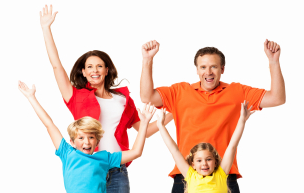 And with an all-day happy hour at the Mexican restaurant, Sonrisa Grill, in the village down the road, my husband and I were pretty enthralled too! Las Vegas – At about $50 US per night, The Downtown Grand is a steal and with 635 rooms, it is considered small next to the larger 3,000 to 5,000-room resorts on the Strip. For quieter rooms, ask to be in the west side of the Grand Tower. 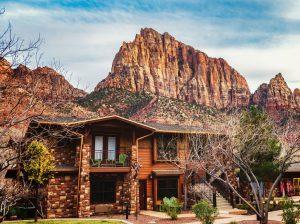 Zion National Park – The Cable Mountain Lodge at the entrance to the park has rooms and suites with fine linens, granite bathrooms, spectacular views of the mountains, an outdoor hot tub (and pool, open in warmer weather) and is building a spa. Kanab – The Victorian style Canyons Boutique Hotel has cruiser bikes available on loan and includes a hot buffet breakfast. Also on site is Chef Shon Foster’s wonderful Sego Restaurant, which offers “social” or small sharable plates that combine southwestern and Asian flavours. Lake Las Vegas – View lakelasvegas.com for more information. For more on Nevada and Utah, view www.travelnevada.com and visitutah.com.